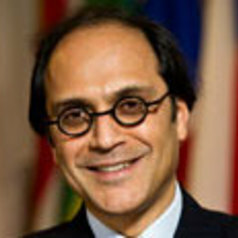 Bhaskar Chakravorti, Ph.D., is the Dean of Global Business at The Fletcher School at Tufts University – the oldest exclusively graduate school of international affairs in the U.S. – and he is the founding Executive Director of Fletcher’s Institute for Business in the Global Context. With the objective of “connecting the world of business with the world,” the Institute explores issues at the intersection of global business and international affairs, including geopolitics, national and international security, digital evolution, peace and conflict, development and the human condition. Bhaskar serves on the Fletcher faculty as Professor of the Practice of International Business, chairs the Council on Emerging Market Enterprises and is on the Executive Committee of the Tufts Institute for Innovation, having served on its founding committee as well. He also serves on the World Economic Forum's Global Agenda Council on the Economics of Innovation, is an Advisory Board member for the UNDP's IICPSD and is a Senior Advisor for Digital Inclusion at the MasterCard Center for Inclusive Growth. Bhaskar is a regular columnist and writer for multiple widely read publications, e.g. The Washington Post, Harvard Business Review, Indian Express, Forbes, Huffington Post, among others. Bhaskar is the founder and principal investigator of three major research initiatives: Planet EBiz, that studies the impact of digital evolution and e-commerce worldwide; Inclusion Inc, that studies sustainable and inclusive business innovations and activities being undertaken by global corporations; Cost of Cash, that studies the impact of the use of cash instead of electronic/digital alternatives in countries around the world. Prior to joining Fletcher, Bhaskar was a Partner of McKinsey & Company, a Distinguished Scholar at MIT's Legatum Center for Development and Entrepreneurship and on the faculty of Harvard Business School and Harvard University Center for the Environment. He was a leader of McKinsey’s Innovation and Global Forces practices, served on its Knowledge Services Committee and taught innovation and entrepreneurship at Harvard. In a 20+ year career, he has been an advisor to CEOs, senior management and Boards of over 30 companies in the Fortune 500 and worked across the Americas, EU, Asia and Africa, and multiple industries. He is the author of the Amazon.com best-selling book, “The Slow Pace of Fast Change: Bringing Innovations to Market in a Connected World” (Harvard Business School Press). His papers and articles appear in top-tier academic journals, multiple books and in widely-read media, e.g., Harvard Business Review, New York Times, Wall Street Journal, Financial Times, Washington Post, CNN, Foreign Affairs, Forbes, FORTUNE, CNBC; his interviews feature in BusinessWeek, The Economist, Fortune, Wall Street Journal, New York Times, TIME, BBC, FT, Fast Company, CNN, New Yorker, as well as several international media, such as The Times of London, The Times of India, Valor, Economic Times, China Daily, CCTV, Al Jazeera, etc. Bhaskar is a regularly invited speaker at global conferences, e.g. the World Economic Forum, The Economist, Bloomberg, the Milken Institute, Skoll Global Forum. Bhaskar's work has been multi-sectoral and global; examples include: development of auctions worldwide in launching the wireless communications industry, creation of a modern international telecommunications network connecting the continent of Africa, establishing of geo-location services, enhanced public safety infrastructure in the US, the launch of multiple-billion dollar bio-pharmaceutical products and medical devices, establishing innovative new business units in multiple high tech companies and growth of the global solar energy industry. His work has been influential in policy making on Capitol Hill, the Federal Communications Commission and to a US Presidential Task Force. His (co-authored) article, “Where the Digital Economy is Moving the Fastest” was among the Most Read Articles of 2015 in the Harvard Business Review and has been widely influential in policy and strategic dialogue on the state of the digital economy in countries around the world. Bhaskar organizes two sets of regular global conferences at The Fletcher School, one that focuses on inclusive growth (see here for a report from the last conference, “Inclusion Inc.” in the series) and another that focuses on a country or region that is going through an inflection point (see here for a report from the last conference, “Turkey’s Turn? Perennial Linchpin or Emerging Hub”, in the series). The work of his institute is supported by various philanthropic organizations, such as the Gates Foundation, Rockefeller Foundation and Citi Foundation, as well as corporations, such as MasterCard Worldwide and State Street Corporation. Bhaskar's prior appointments were as a Partner and Thought Leader at the Monitor Group, a game theorist at Bellcore (formerly Bell Labs), assistant professor at the University of Illinois at Urbana-Champaign and a TAS officer with India's Tata Group. His PhD in economics is from the University of Rochester, where he was a University Fellow. He is a graduate of the Delhi School of Economics and in economics with honors from Delhi University’s St. Stephen’s College. He was born in New Delhi, India and lives in Brookline, MA.